When stuck for things to do over the Christmas period with your children or charges, have a go at these festive activities and Christmas crafts. Decorating your own Christmas tree – a perfect activity for children of all ages to get involved with. As Christmas time approaches, its time to think about suitable gift ideas to give you your nanny or child carer. It is nice to reward your nanny or child carer with a special Christmas gift to thank them for all their hard work in the year. Whether you have a permanent, live in nanny, a part time daily nanny, or an occasional babysitter, they should be rewarded with something something to show your appreciation. So, if you are stuck for ideas or looking for some inspiration, check out our gift guide. A range of ideas depending on your budget/ how much you are willing to spend. A great place to start is to have a think about what they love or what there passion is. For example, if they love tea you could buy them a selection of different flavored teas, or if they are a coffee drinker, you could get them a travel coffee thermos to take on the school runs. Consider what they enjoy doing and see if you can relate a gift to it. Know your Nanny! Take a note of their interests. Have a think about what your nanny/ child carer loves and enjoy. Personalise it with special gifts that they will LOVE. Consider what their favorite type of food is, what they love to drink, what they love to do in their free time or what their favourite genre of book is. Gather together a few items and put it together as a gift. You may decide organise it in a special box or hamper. Go the extra mile and make it look special. You may decide that you don’t want to give a gift but instead feel that giving a little extra pay or a Christmas bonus is more appropriate. This is a great gift to show how much your appreciate all the work that they have put in over the past year. 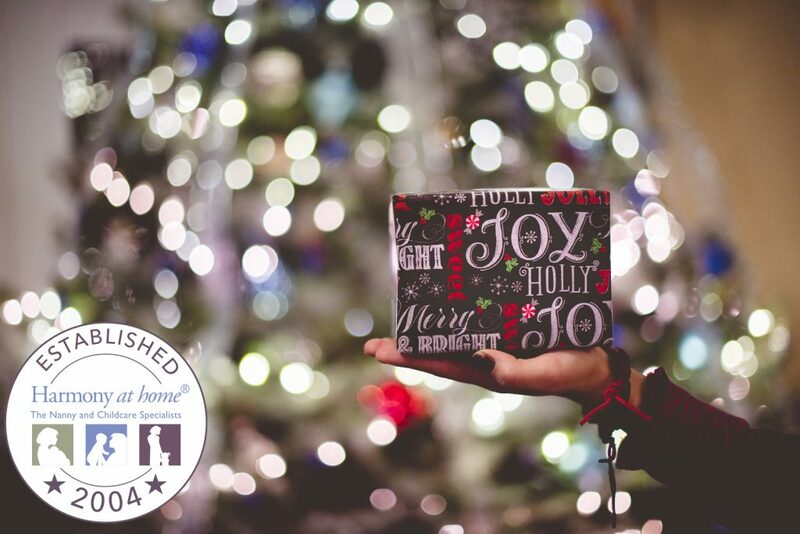 If you are unsure of a gift that they might like, consider a gift voucher for their favourite place to shop, place to eat or place to visit. A great gift for those who are tricky to buy for. If you know what your nannies favourite author or genre of book is, check out your local book store and see if you can find one they will love. A gift that has shown thought and time is one that will be appreciated. Does your Nanny love to go to the theatre? A trip to see a show is something they can look forward to. If you are looking for a gift that is a little more personal, then getting your children to make something special is perfect. This is the ideal gift option for a temporary nanny or part time nanny or babysitter. It shows how much you care, with out having to spend a lot of money. Decorate a plate, cup, bowl with children’s hand/foot prints. 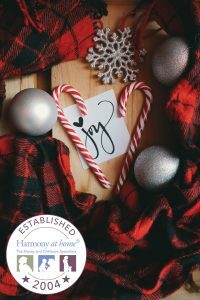 As we approach a new year, give the gift of a nanny diary. The perfect place for a nanny to make notes of their charge and keep employers up to date with key information relating to their child. This is a great gift for those child carers who look after young children and is always greatly received. Whatever you decide to get your Nanny or child carer make sure you do it in time for Christmas Day. Don’t forget to allow them time off to relax and recuperate and to feel fresh for the new year ahead. If your Nanny is a keen learner then why not give them the gift of a training course to expand their skills and knowledge. Harmony at Home have a fantastic range of childcare courses that are perfect for all nannies and child carers. Giving the gift of a training course gives nannies the opportunity to develop their knowledge and can help to progress their career. What is the difference between a Live in Nanny and Live out Nanny? When it comes to hiring a Nanny to help you care for your children, it can be difficult to know what you are looking for exactly. There are lots of questions that you have to think about and consider. Do you want someone to work on a full time or part time basis? Is this going to be a permanent or temporary placement? What will their role include exactly? And not forgetting one of the most important questions, are you looking for a live in or live out Nanny? Before you decide what the best option for you and your family is, it is important to know the difference between a live in and live out nanny so you can find the childcare solution. As the term suggests, a live in Nanny is someone who lives with you and your family in your home on a full-time basis. They would usually be expected to work between 11 – 12hours per day, Monday – Friday, with the occasional evening babysitting, 1 or 2 times a week. When it comes to the cost of having a live-in nanny, the wage they would be paid would tends to be less than that of a live out nanny. This is because their board and lodging would be included. If hiring a live in nanny, you would be expected to be able to provide some sort of living accommodation for them. This may be in the shape of their own bedroom and bathroom, or in some cases a shared bathroom with the children in the home, or, separate living accommodation offsite but still close to the family home. Some families are able to offer an outbuilding or converted space solely for the nanny. A special relationship is often built up between the family and the nanny. Even though many consider their live in nanny as a member of the family, it is important to remember that they may need their own time and privacy. Live in nannies are able to provide care to your children on a sole charge or shared basis, and may have professional Nanny Qualifications such as a Norland Diploma. It is extremely important to agree and set out the roles and responsibilities of a live in nanny in their contract prior to employment. They should be aware of their daily duties and what is expected of them. The primary role of a live in nanny is to care for and look after your children, taking care of their needs. A live in nanny is also able to take on all additional nursery duties. Maintain the general tidiness of the home. A nanny is not a housekeeper and is not there to clean the house or perform tasks such as washing and ironing. If you are looking for someone who is able to carry out these tasks, a nanny housekeeper would be ideal. Flexibility Guaranteed – A live in nanny can offer the flexibility that a daily or live out nanny may not be able to. If necessary and agreed, they can start early and finish late. This is especially beneficial if you are working parents and can give you the reassurance that you need, knowing that childcare is covered if you should work late unexpectedly or work irregular shift patterns. Gain a member of the family – A live in nanny is more than likely to build up a relationship with you and your family. Offering you loyalty, security and a great level of care. Gets to know your family’s needs. Many will take on light housekeeper duties – A live in nanny will take on housekeeping tasks relating to the children. For example, doing the children’s washing and tidying their bedrooms. Opens up the search – As accommodation is covered, it gives you the opportunity to open up your search across the country and even internationally. Lasting bonds and special relationships are built up and established. A live out nanny, also known as daily nanny, is either employed on a part time or full time basis. On average, they will work up to 10 hours per day, Monday to Friday. Babysitting and additional care will need to be arranged and added on to their agreed number of hours. The main difference to a live in nanny, is that a live out nanny will travel to and from the family home each day to start work and finish work at an agreed time. A daily live out nanny can be in sole charge of your children and perform nursery duties, just as a live in Nanny would. A professional, friendly relationship between you and the nanny can be maintained. You don’t have to worry about providing accommodation for the nanny. Usually a live out nanny is local to the area you live in, thus meaning they are familiar with the community and suitable areas to take your children. Both child care options are good and will benefit you and your family in different ways. The important thing to remember is to find what works for you and your family. 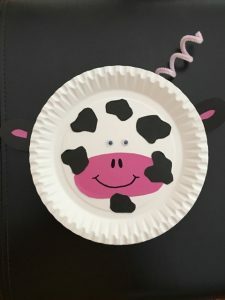 If you have some left-over paper plates from a recent party or event, why not have fun and get crafty with your children or charges? Don’t forget to give your bunny a name! Grab some black card and cut out a number of different size and shape dots. Using the same black card, cut out 2 ear shapes. Once you have you 2 ears, grab a piece of pink card and cut out 2 of the same shapes smaller and stick onto the black card. 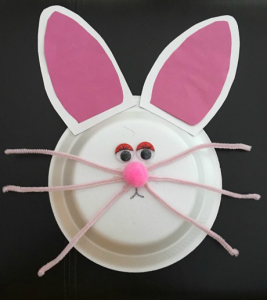 With the same pink card, cut out a large oval shape to use as the mouth. At the bottom, secure the mouth down with glue and arrange the black spots around the plate. Secure these with glue and secure your ears either side too. Don’t forget to give your cow a tail! Use a pink pipe cleaner and wrap around a pen to create the curl. When desired look has been created, secure to the back of the plate with sellotape. Once you have your shape, grab some red tissue paper. Simply tear off stripes, scrunch and stick down. This will need to be done to cover the entire plate. 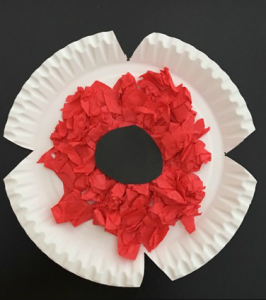 Using some black card, cut out a small black circle to stick in the middle of your poppy. 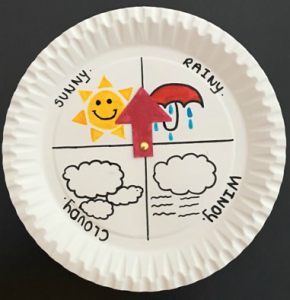 Using your weather chart, encourage your children or charges to have a go at identifying the weather at the start of each day. To make learning the time a little easier, write on the appropriate time labels. For example, quarter past, half past. It wouldn’t be a clock with out the clock hands, so you will need to cut out 2 hands from a piece of card. You will need to make one big hand and one small hand! 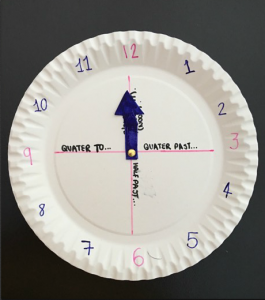 Once you have created your clock, decorate as desired and have fun learning the time. Cut out the middle section of your paper plate so that you are just left with the outer ‘ridged’ part. 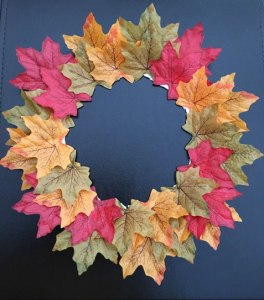 Once you have secured all leaves down, choose a place to hang your creation! Do you have specific traditions that you do as a family every year? Marshmallows/ smores – A bonfire night must! Hot chocolate – To keep you warm whilst watching the firework display. Stand at a suitable distance away from the bonfire and fireworks. Usually, the area will be sectioned off and should be avoided. Make sure children are aware that they cannot go near the area. Keep a bucket of water close by in case of any emergencies. Make sure you and your children or charges are warm. With winter time well and truly underway, November is often a very cold time of year. Make sure you are wearing plenty of layers, a thick coat, a pair of gloves, a scarf and a hat or ear muffs. Make sure your children or charges are recognisable in the dark. Children should wear recognisable or fluorescent clothing. Make sure small children are kept in pushchairs or on safety reins to prevent them from running off. Make sure no pets are around the bonfire or fireworks. Pets should be kept in side at all times when fireworks are ongoing. It is important to remember that not everyone enjoys fireworks and for some, they find bonfire night particularly scary. If your children or charges are scared of the fireworks and don’t want to watch from outside, don’t worry about them missing out. Fireworks can still be enjoyed from inside, watching by the window. To get an even better view, turn your lights off in your house! Close all windows inside your home to reduce the sound of bangs and explosions. Close all the curtains to try and block and the light from the fireworks. Try to keep everything as normal as possible. If your pet is hiding or trying to keep themselves distracted, let them. If you have a dog or a pet that needs walking, make sure you do so, prior to the fireworks starting. 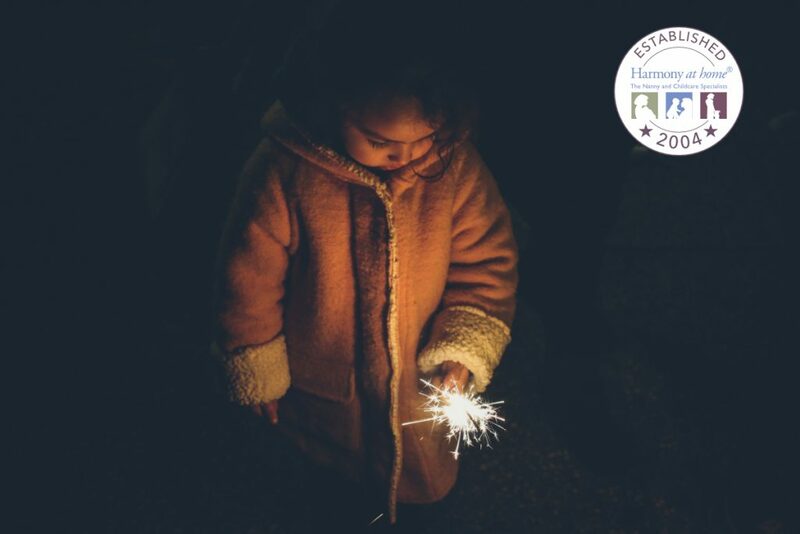 To find out more, check out the RoSPA website to get a full understanding of firework safety!